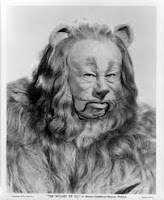 Mental Health and More...: The Cowardly Lion Returns! The poor Cowardly Lion in the Wizard of Oz received a bad wrap! He explained to Dorothy, The Tin Man, The Scarecrow, and to the Wizard that he had no courage, because he had fear. How wrong he was! How often do we feel the same, though? We assume that in order to be courageous we maintain a level of feigned strength and Superman-like power; when in fact, we have to have fear in order to have courage. If we were not afraid of anything, then we would not have the chance to make courage active in our choices and behaviors. Little did the Lion know that every time he took a step forward with uncertainty of what would happen he was building courage and strength.